KANSAS CITY, Mo. – (Box Score) No. 1-seeded Hope International shot 51.6 percent from the field in the second half to erase an eight-point halftime deficit and claim a 74-62 win over No. 8-seeded Martin Methodist (Tenn.), Saturday evening in the quarterfinal round of the 2015 Buffalo Funds-NAIA Division I Men’s Basketball National Championship in Municipal Auditorium. The Royals will face the winner of No. 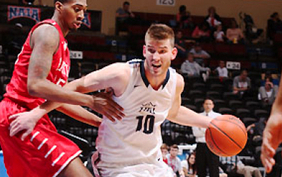 13-seeded Mid-America Christian (Okla.) and Westmont (Calif.) on Monday, March 23 at 8:00 p.m.
Hope International (32-2) trailed at the half for the third time in as many games in the national championship, shooting 32.0 percent (8 for 25) in the first half and getting just three free throws on six attempts. The Royals were held without a field goal for the final 8:19 of the opening stanza, while Martin Methodist scored 15 of the final 16 points headed into intermission for a 30-22 lead. The Royals’ second half performance was also similar to those of the first two rounds, improving its field goals percentage for the third-straight game after the half while continuing to excel on the defensive end. Hope International hit 16 of 31 field goals (.516) after the break and converted 15 of 21 free throws, limiting Martin Methodist to a 34.4 percent shooting clip (11 of 32) in the process. Liam Hunt gave Hope International its first lead of the second half at the 14:21 mark off of a putback of a Matt Green missed shot. The RedHawks tied the game on the next possession, but the Royals followed that up with a 14-2 run, capped off by a Hunt three-point play for a 56-44 lead. Martin Methodist got the deficit under double digits just once the rest of the way. Green led the way for Hope International with 21 points to go along with five assists and hit five three-point shots. Kenny Morgan added 15 points, five assists and four rebounds, while Austin Sanford provided 11 points, 11 rebounds, two steals and two blocked shots. Carlton Hayes also grabbed 10 rebounds as the Royals posted a 47-35 advantage on the glass.